The EcoHitch® hidden hitch for the 2012-2014 Ford Focus Electric EcoHitch is designed to be completely concealed so you only see the receiver once it's installed rather than having to see an unsightly crosstube underneath your vehicle. This hitch, just like your electric Ford is charging ahead to help you get to your next adventure. Rated for 300 pounds tongue weight and 2,000 pounds towing weight, this Ford Focus Electric EcoHitch won’t make you have to choose between items to take on your next adventure in your electric vehicle. *If you’re going to be towing and need trailer wiring, click here! Ensure your wiring harness does not drag on the ground by visiting our Eclipse trailer wiring bracket page. *For more information on trailer wiring, click here! With the electric Focus, you are getting an Earth friendly vehicle where looking good is standard, so shouldn’t your hitch be the same? You need a trailer hitch for your Ford Focus Electric that is just as unique as your Ford. Made from recycled, eco-friendly materials, we’ve created a perfect complement to your car with this hitch for the Focus that won’t compromise on style or performance, only the EcoHitch hidden hitch receiver is visible when installed. 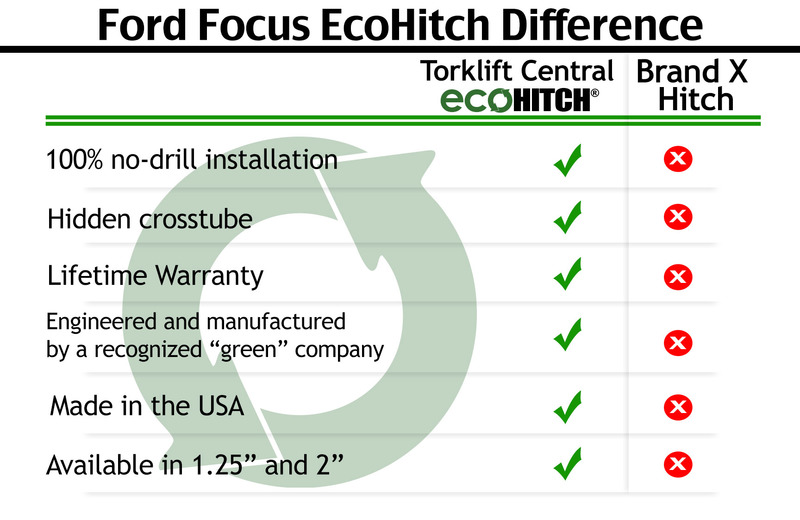 The EcoHitch® hidden hitch for the Ford Focus is engineered to meet stringent national SAE J684 standards and comes in both 1¼” and 2” receiver sizes so you get your choice of what bike racks and cargo trays will work best for the receiver you choose. With 300 pounds tongue weight and 2,000 pounds towing weight capacity, our lightweight hidden hitch will give your Ford the ability to all kinds of good times.